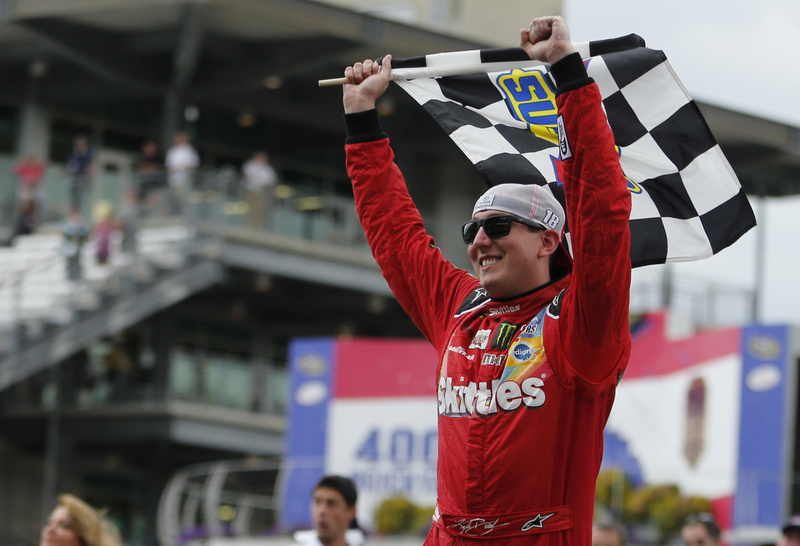 Kyle Busch’s incredible comeback rolled through Indianapolis Motor Speedway, where Busch won the Brickyard 400 on Sunday for a weekend sweep at the historic track. Now he has a prestigious Brickyard victory to give him one of NASCAR’s elusive crown jewels. His Indianapolis victory ranks alongside his Southern 500 win at Darlington Raceway as the biggest of his career. “Maybe I found my happy place,” Busch said in victory lane when asked if he has found a new perspective since he was injured in a crash the day before the season-opening Daytona 500. “We’re a championship contending team, we just need to be championship eligible,” Busch said. Kevin Harvick was third in a Chevrolet, followed by Martin Truex Jr., Busch teammate Denny Hamlin and Clint Bowyer. Ferrari driver Sebastian Vettel won the Hungarian Grand Prix in Budapest for the first time, while Nico Rosberg blew his chances of catching Lewis Hamilton in the title race when he punctured a tire near the end. Four-time F1 champion Vettel started third on the grid. It was his 41st career win and first since the Malaysian GP in the second race of this season. Red Bull took advantage of late chaos as Russian driver Daniil Kvyat placed second and Daniel Ricciardo, who clipped Rosberg with five laps to go, took third. A poignant minute’s silence was held in honor of Jules Bianchi before the start of the race, with drivers forming a ring and placing their race helmets on the ground. Bianchi’s mother Christine and father Philippe, brother Tom and sister Melanie joined the drivers in the ring as they all linked arms on the grid to remember Bianchi. The French driver died last week from injuries sustained in a head-on crash at the Japanese Grand Prix last October. Steve Torrence raced to his first Top Fuel victory in more than two years, beating Tony Schumacher in the Mopar Mile-High NHRA Nationals at Bandimere Speedway in Morrison, Colorado. Jack Beckman won in Funny Car, Larry Morgan in Pro Stock, and Eddie Krawiec in Pro Stock Motorcycle.